This is the front page of the UK newspaper The Daily Mirror today. 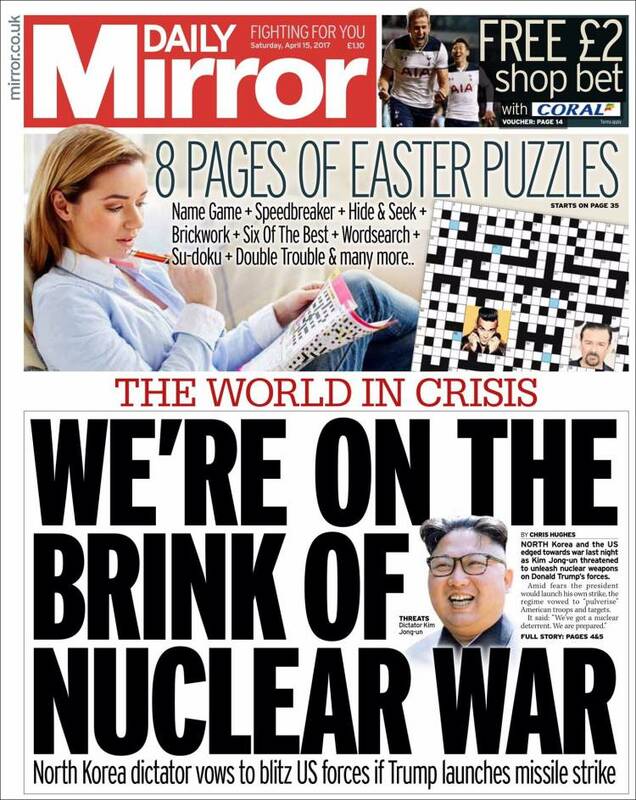 "We're On The Brink Of Nuclear War" cry the headlines, yet only two weeks ago the UN held a week of nuclear ban treaty negotiations. The UK government boycotted the negotiations. In the 1980s nuclear war felt like a real possibility. People were aware that with a huge arsenal of weapons was held on British soil, much of it 30 miles up the road from my home in Glasgow. No walk in the Scottish Highlands was complete without a couple of low flying RAF jets buzzing past you and when I used to camp in Glen Douglas, near Inverbeg, with my school friends we were aware that there were underground silos at the western end of the glen, never moreso than when a couple of soldiers woke us one night to ask why we were camping here. Scotland was going to be on the front line of any nuclear conflict. Realistically this would mean millions of civilian deaths across the globe and the destruction of our environment. So people organised against it, let our leaders know that we knew this to be wrong. I spent many a weekend in my teenage years up at Faslane near Helesburgh or over at Holy Loch near Dunoon joining CND protests. Aged 14 I was an organiser in Glasgow West Youth CND, and went as a delegate from CND to the World Festival of Youth and Students in Moscow in 1985. There I attended speeches by the new Soviet leader, Mikhail Gorbachev, who in the coming years stepped back from the arms race that had been running up until that time and signed several disarmament deals with his US counterpart, Ronald Reagan. The world breathed a sigh of relief, but the threat never went away. As the nuclear powers around the world, including the UK, refused to completely disarm other countries were keen to develop nuclear weapons themselves. India, Pakistan, Israel and North Korea have joined the UK, Russia, USA, China and France in building up nuclear arsenals. The result is now that more leaders around the world than ever before hold a priaptic finger over the nuclear button. And when those leaders include the delicate egos that are Donald Trump and Kim Jong-un I think nobody is surprised that the Doomsday Clock is now closer to midnight than it has been at any time since the early 1980s. If you have read Eric Schlosser's book Command and Control you will know that good fortune rather than cool heads is the only thing which has avoided nuclear catastrophe over the past 50 years, and the more weapons there are on standby, the risk of an accident increases day by day. So to reduce the feeling of impending nuclear annihilation I have been getting prepared and flicking through the re-assuring pages of my copy of "Protect and Survive", the British government's pamphlet from 1980 full of handy tips on what to do in event of a nuclear strike. I now feel quite justified in refusing to ever throw anything out. In case you don't still own a copy and the government don't get the chance to quickly re-print it when the big one goes off, I have dashed off copies of the one I have, for your education. I hope that this makes everyone feel much safer. Alternatively you may want to support those campaigning for nuclear disarmament by either joining, or donating money to Scottish CND or CND UK by following the links. In Scotland the Scottish Green Party and The Scottish National Party support unilateral disarmament for Scotland. I know I would feel much more safe if we did not have a target painted over Glasgow, and imagine what a lead we could take in the world at this time by getting rid of these weapons of mass destruction from our country. Click on images below to expand. Disclaimer - I have no evidence that painting your windows white and hiding under a table will protect your family from a nuclear payload detonated over your city, but good luck with that. For more information you may wish to watch the Raymond Briggs animation "When The Wind Blows".